Nigeria, USA, 2014 , 120 min. 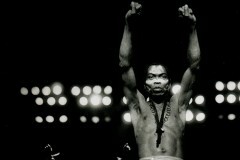 Afrobeat pioneer Fela Kuti’s magnetism reverberates through time. The social and political significance of his life’s work is considered through historic clips and scenes from the Broadway musical Fela!